PUMPKIN FACES TO PRINT & USE FOR CRAFTING & PUMPKIN CARVING INSPIRATION EVEN FOR HOMEBAKED GOODIES TOO! Print and use on crafts, cards, tags etc. 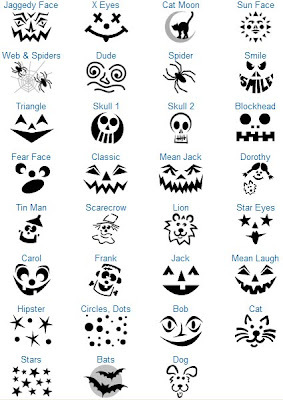 You can enlarge the clip art before printing to use as a template for carving your pumpkins. How about sizing them to use as a stencil to sugar coat cookies & cupcakes with colored sugar or dust them with cocoa powder or confectioners sugar or sprinkle with non perils or trimets in festive Halloween colors.